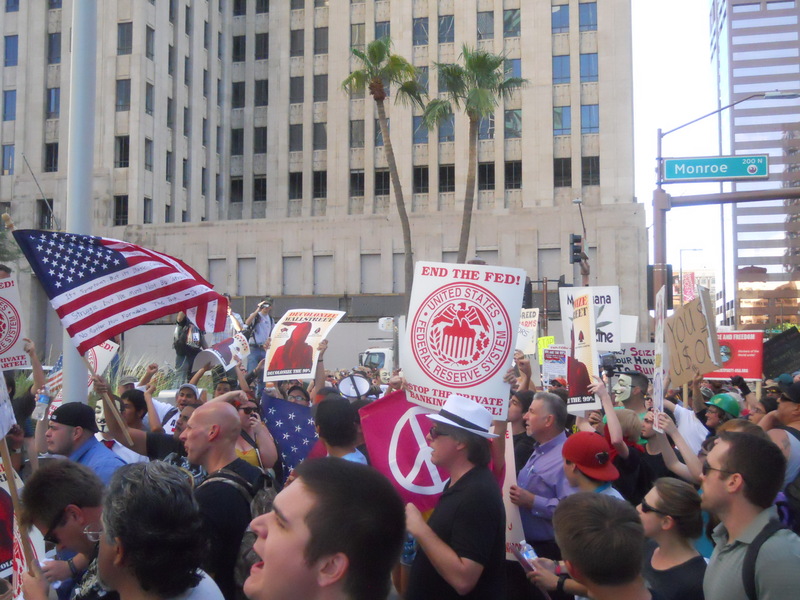 Earlier this week I posted some photos of the pre-occupation march and initial occupation at Cesar Chavez Plaza. On Wednesday I returned in between classes for a few minutes and then again in the evening for a few hours. 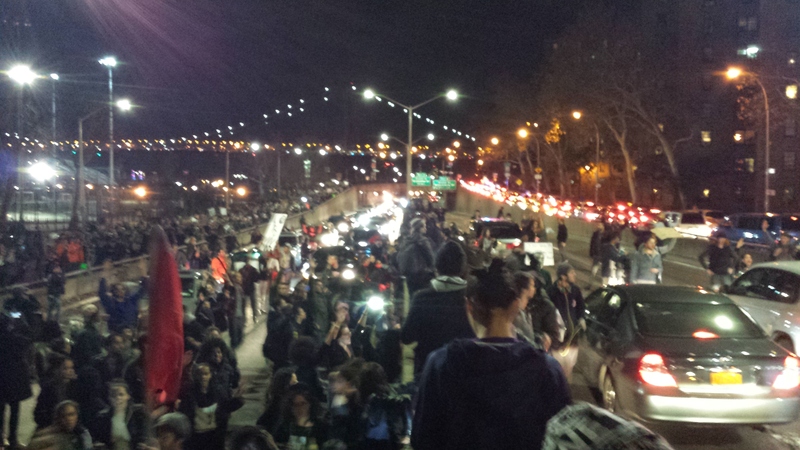 It turned out to be a pretty big night for the occupation. The water and food station near its height. After the initial confrontation on Saturday, the occupation has been constantly in flux, shifting from plaza to sidewalk. The plaza closes at 6.00 in the evening, and around 5 or 5.30 occupiers pick up and move everything. Cars pull over to load up countless coolers of water and boxes of chips and bread, the first aid station is packed up, everything is taken off site. Protesters remain, but they remain within four feet of the road, on the periphery of the plaza – and they can’t sleep. In a show of support, several businesses have tried to lend a hand. The Five Guys around the corner has offered its restrooms to occupiers, and those who can patronize there to return the favor. After Wednesday night’s General Assembly a large group walked there to buy dinner, and there was even a proposal to buy cleaning supplies and send crews to clean the bathroom for them as a sign of thanks. A cafe called Conspire has been a hub since the beginning, gathering food there even before the occupation began. On Wednesday there were rumors of the cafe extending its hours to allow occupiers to use the internet and get some rest. On Wednesday, as it got closer to closing time, we began to pack things up. As we loaded water into a truck there was a sudden call for a time-sensitive GA. The police had decided to stop enforcing the plaza closure. It’s hard to say whether it was pressure of the City Manager (who had been somewhat shamed at a city council meeting earlier that morning when occupiers stated that he could have prevented the mass arrests Saturday night by giving an earlier warning) or from police department worries about putting sleep-deprived people on the edge of the road in the middle of the night, but either way they made their decision. We discussed the caveats as a group – sleeping would still be prohibited and no-camping rules were still in effect, and we were trying to figure out where that line fell. That night, someone brought a kettle of warm pasta, which was a well-received change from the peanut butter sandwiches and chips that we had been eating. More and more people flowed in as we prepared for the general assembly. The number of occupiers has big spikes and lulls, like I’m sure many occupations have. Compared to what I’ve heard from people in New York and Oakland, the occupation in Phoenix doesn’t have the community feel just yet. It might be because there had been so much back-and-forth in the first few days. Last Saturday there was a market place and a library, but both seem to have been shelved during the move. Despite having lasted six days now, when I was in the plaza it felt temporary. During most of the day the plaza had one gazebo, a bench, a computer, and a collection of coolers – the rest was people and food. The authorities must be happy with this – it looks more like a birthday party at a park than a politically engaged and self-sustaining community, if not for the countless signs. But with the plaza opened indefinitely, I hope to see the occupation grow. It seems that the authorities are already trying to stymie the growth. As the police presence dwindled on Wednesday, the sergeant on the scene discussed with a couple of us some of the finer points of what would be allowed and what wouldn’t be. Right as he left, he told me that the media center – a desktop computer under a tree running the livestream – was borderline and might have to go. This afternoon, the power to the plaza was cut, shutting down the media center and anything else the occupiers had plugged in. There are a handful of car batteries and two solar panel chargers, but the occupiers don’t have enough to provide power to the whole plaza. In addition (and maybe only because the power is out) the city WiFi network usually available at the plaza is also gone. The occupiers are currently marching, and there is a campaign going to call the mayor to convince him to turn the power back on. Meanwhile, it seems that while the plaza may be open to the occupiers to stay in, they won’t be able to sleep, camp, cook, record, connect, or organize. The city gives, but the city also takes away. 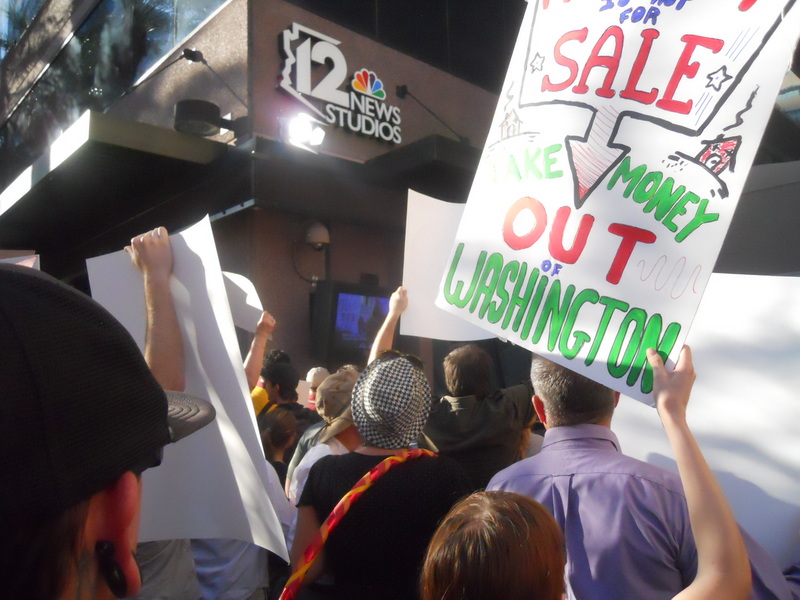 Occupy Phoenix has begun this week, although it’s had a rough time. I was only there for the very beginning, but plan on returning tomorrow and give you all another post. Here are some photos from days 0 and 1, followed by a short run-down of what I’ve missed. 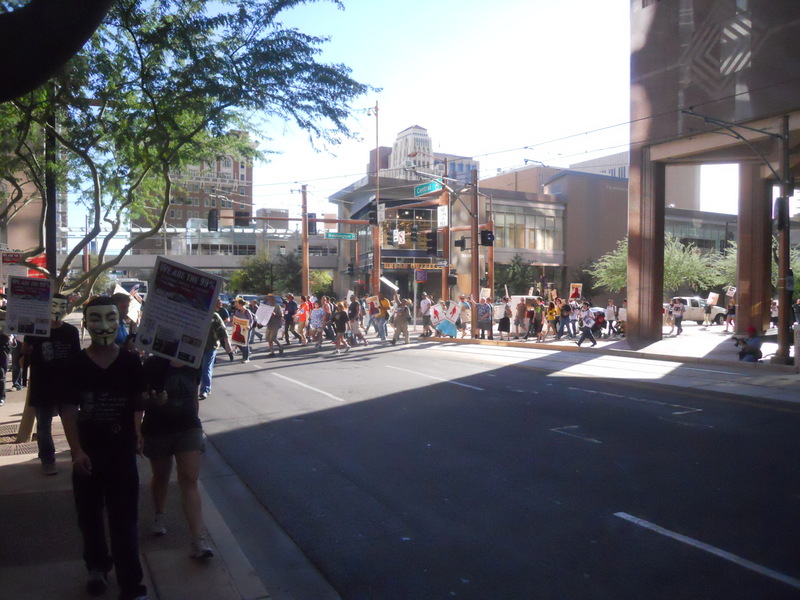 Last Friday, there was a pre-occupation march through downtown Phoenix. It lasted a few hours, replete with lots of chanting at numerous locations before ending at Cesar Chavez Plaza, where a group of Arabs were demonstrating against Syrian President Bashar al-Assad. The two groups joined up pretty seamlessly before an occupier read the Occupy Wall Street declaration and a band played some anarchist acoustics. Outside Chase Tower, chanting "Chase got bailed out! We got sold out!" 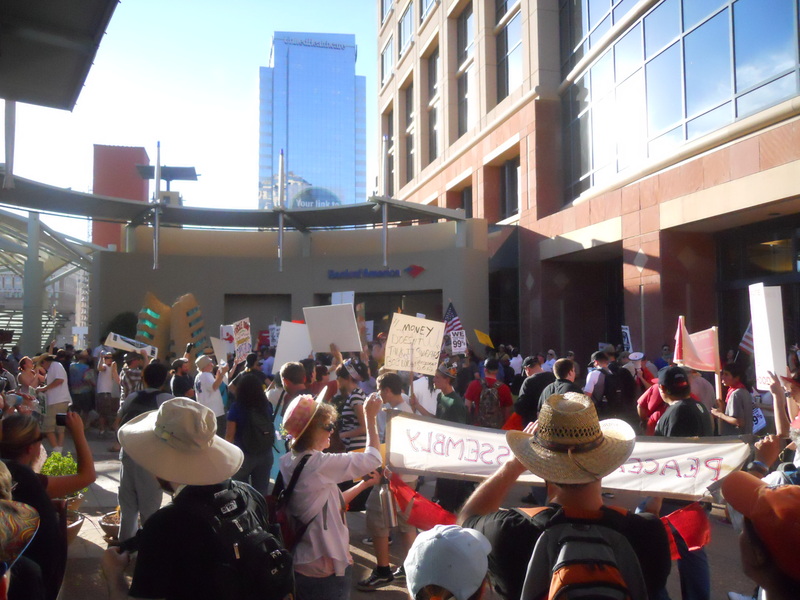 This is only about half the crowd (I was in the middle) headed towards Cesar Chavez Plaza. 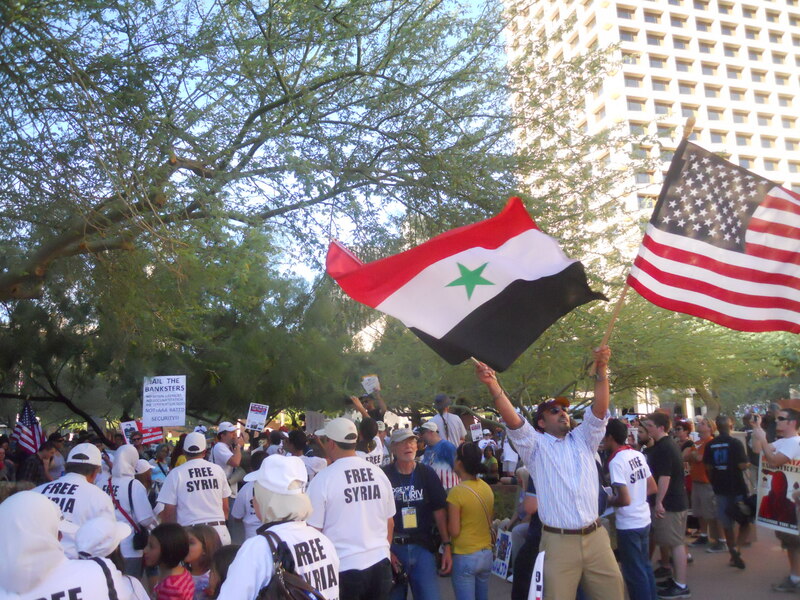 The Syrian demonstration is joined by Occupy Phoenix. 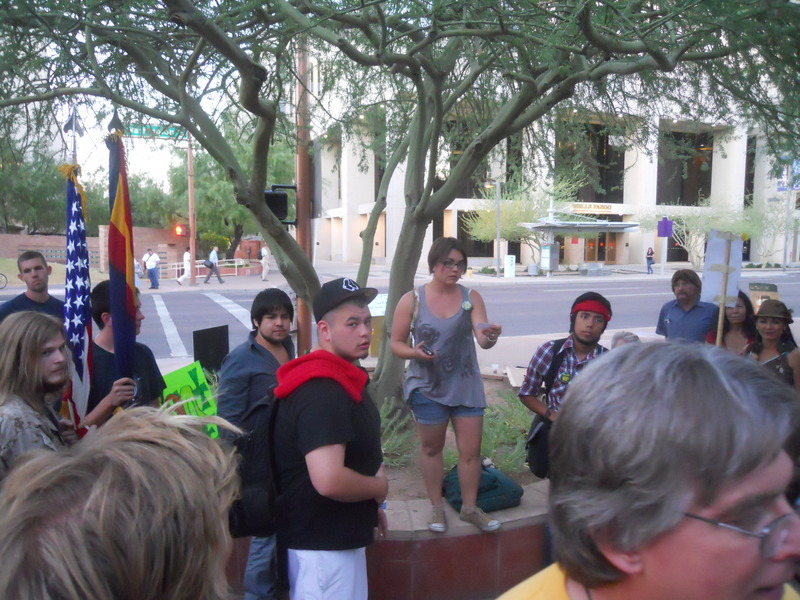 Saturday, protesters returned to Cesar Chavez Plaza to begin the occupation. I arrived about an hour and a half after it began, and missed the armed presence of a local militia, which caused some controversy. What I saw was a small but thriving community. I didn’t get photos of everything, but there was a main circle of speakers outside City Hall, surrounded by smaller circles, a book store, a “free” market, a food table with bagels and pizza, a water station, and people signing petitions for an open primary. The whole plaza was well over 1,000 when I was there, I heard 2,000 quite often. Speaking about nonviolence in a smaller circle. Everything else I know is from Twitter, the Downtown Devil’s Saturday coverage, and the livestream. Saturday night the crowd marched from the Plaza to Margaret T. Hance Park to set up camp. 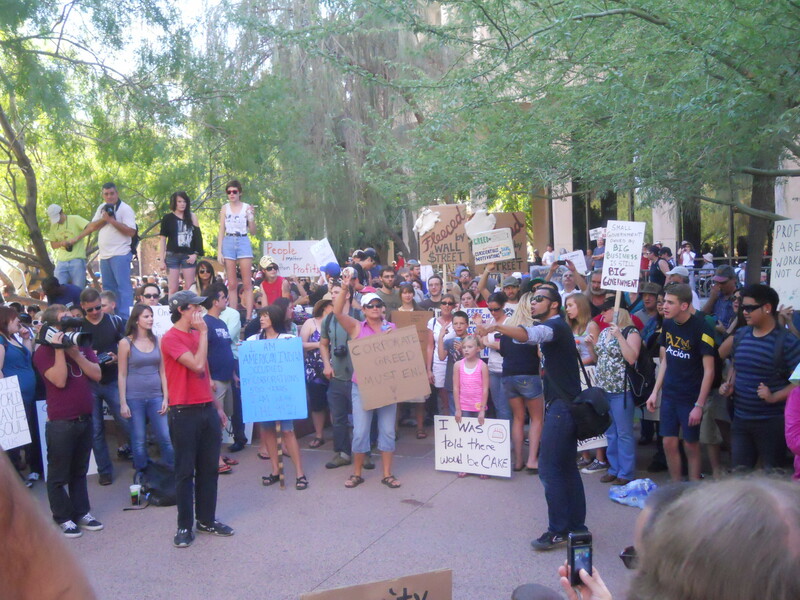 Phoenix Police warned that anybody in the park when it closed would be arrested. 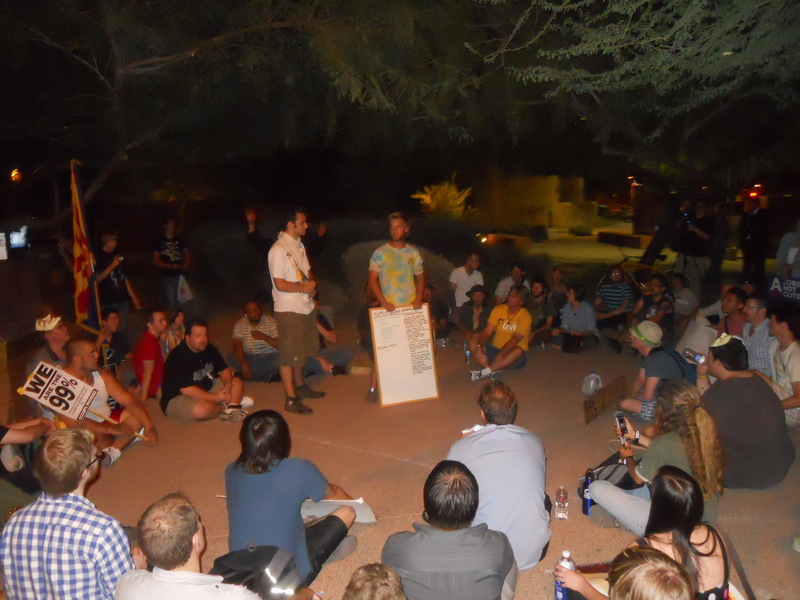 After initially claiming to be leaderless, the Occupy Phoenix crew eventually designated representatives to meet with city officials to negotiate a lawful occupation. 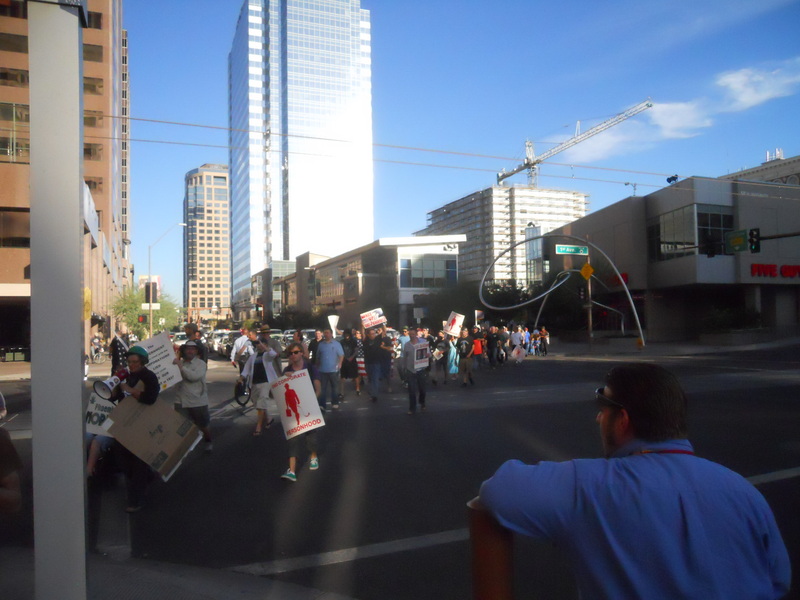 It was around this time that a rumor circulated that Phoenix Mayor Phil Gordon said that if the police arrested the protesters, he would come out to get arrested. In the end, the negotiations collapsed and the mayor never showed (later stating that his support was behind civil rights groups and anti-SB1070 groups). Police gave four warnings before marching in and arresting about 30 protesters, leading to this epic photograph. A photo circulating on Twitter: Police close in on protesters on Saturday night. 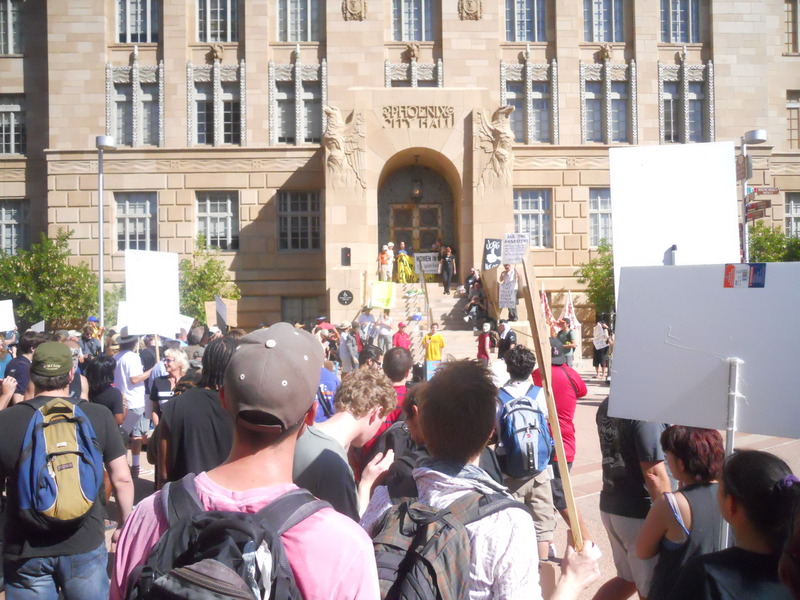 Sunday morning, the occupation reconvened at Cesar Chavez Plaza early in the morning. A group of protesters marched to the 4th Ave. jail to demonstrate in solidarity with protesters inside, but left after finding out that their presence had put the jail on lock down, restricting visitation rights to the protesters inside. The occupation returned to Cesar Chavez Plaza until the park closed, at which time a Marine veteran and protester sat down and was arrested. Two more protesters were arrested while demonstrating in the middle of a street. The occupation slept on the sidewalks. 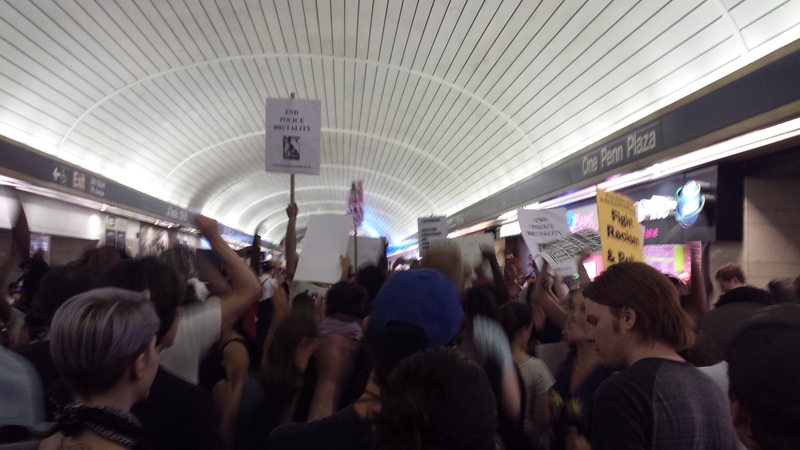 Monday’s protest was generally subdued. The occupation moved back into Cesar Chavez Plaza during the day, and was prohibited from sleeping on the ground at night. 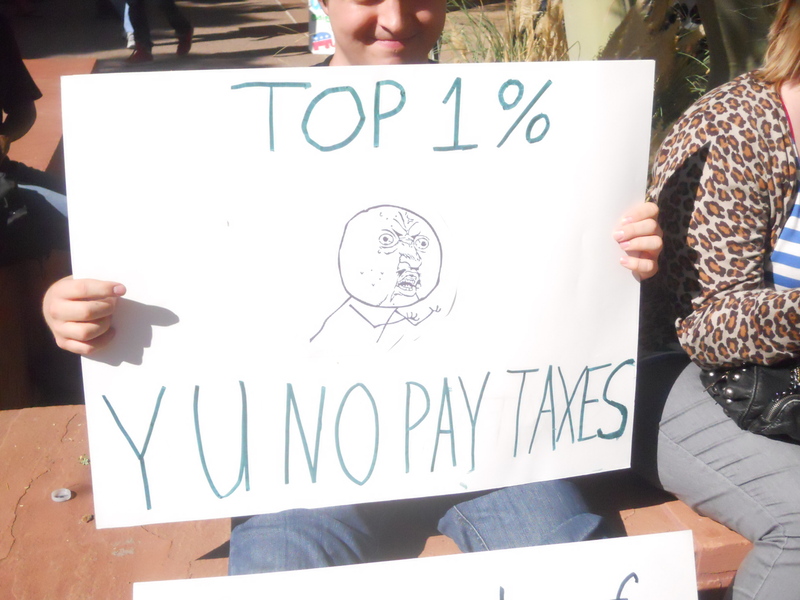 Protesters were mobile on the sidewalks of downtown, with live music and lots of coffee. So far, today has seen a lot like yesterday from Twitter and livestream. 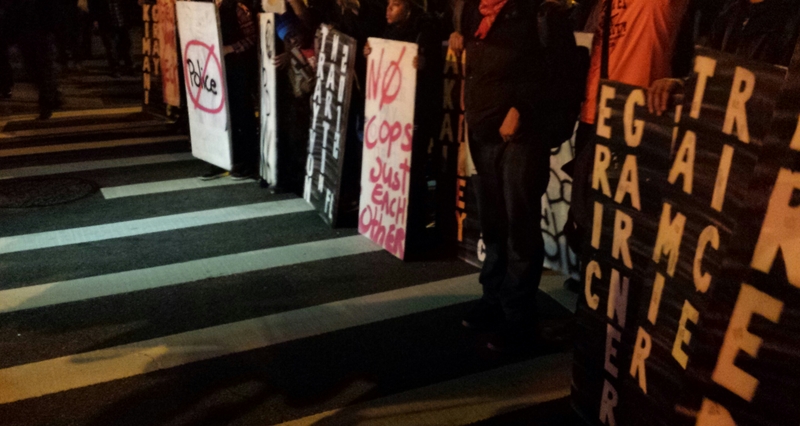 For this evening’s general assembly, the protesters moved to a county island a block away from Cesar Chavez Plaza. 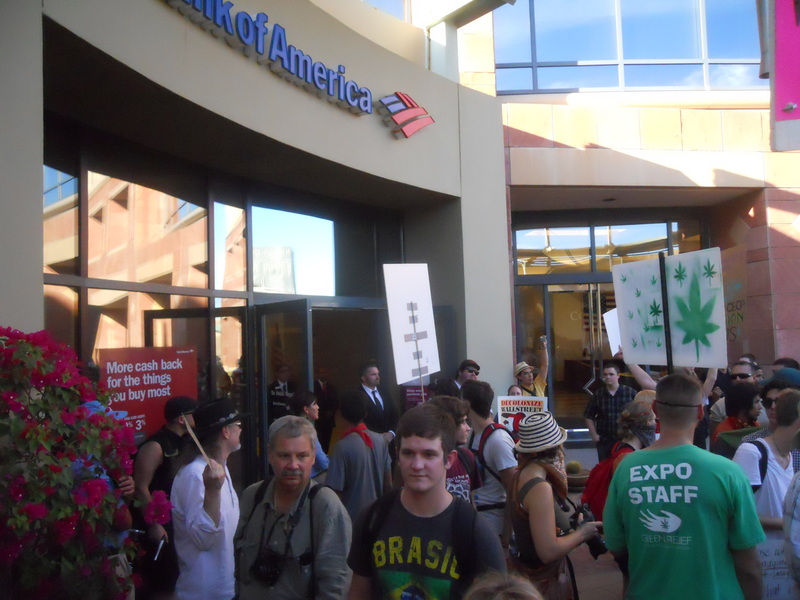 This way they were able to conduct the assembly without worrying about Phoenix PD getting involved, although there were worries that the Maricopa County Sheriff’s Deputies might make an appearance to enforce loitering laws. 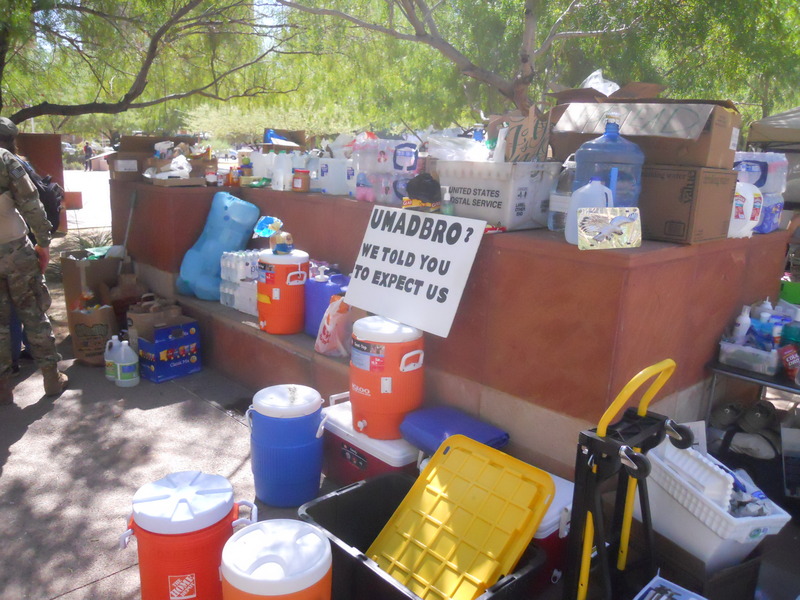 I heard something about the Phoenix City Council meeting tomorrow regarding urban camping ordinance, and some plans to take part in that, although I’m not sure if it’s a protest or actual involvement in speaking at the meeting. That’s all for now. More tomorrow! Apparently, walking to work is illegal. Specifically, the Assistant Inspector General of Police stated that by announcing a campaign to walk to work in solidarity with others, opposition leaders were in effect leading a procession, which requires a permit and all sorts of other limitations. The police went out in force to oppose such illegal processions. Riot police kept Besigye from leaving his home town, a Kampala suburb, because they believed his walk would incite violence. Amid the scuffle, Besigye was shot with a rubber bullet and suffered a wound to the hand. In Masaka some 300 youth, presumably boda drivers, fought with police when their march was interrupted. News outlets were ordered not to provide live feed updates about the campaigns and protests, under penalty of losing licenses. In addition, the Daily Monitor’s internet connection was cut. Several opposition MPs were arrested, and a reporter in Masaka was attacked by police. Masaka’s actions seem to have been started by young boda drivers walking their motorcycles across town in protest, but the protest grew in size and resulted in the army taking over the town. These young kids are bearing the brunt of Museveni’s economic policies, and it’s interesting to see just how the security forces responded to their protests. Meanwhile, when police arrested opposition figure Norbert Mao, they incited violence. After Mao was arrested, Gulu erupted. Eventually the police called in the army, who showed up in armored cars with guns firing. With the town suffering a blackout, citizens burned tires and threw stones at the army. Three people were killed and Mao has called for a prayer and fast in protest. Some have been saying that the army was able to restore calm and stability. I’d have to say, restricting the rights of the press and of protesters, even the rights of people to work peacefully to work, is hardly a status quo worth staying in.